Published: June 28, 2017 at 11:01 a.m. Updated: June 29, 2017 at 02:40 p.m. Interested in rooting for one of the NFL's 32 teams -- but don't know where to start? Adam Rank has you covered with this series, which will present a handy guide to becoming an instantly rabid fan of each organization in the league. Below, find out why you should root for the Baltimore Ravens. Oh, lord. I'm not stirring that pot. And if you've never heard of this (or PFT Commenter), then here's a quick oral history of the phrase. Honestly, though, it seems impossible to me that someone walking the Earth today has avoided this. I would like to believe that if there are aliens monitoring us from galaxies away, they have pondered whether Joe Flacco is elite or not. Like that scene in "Independence Day" where that alien has that one dude and is talking to President Whitmore about destroying the Earth? You know the one. I'd like to believe, if that movie were made today, the alien would telepathically tell the President that he's going to destroy the Earth, and then unveil a hot take about Joe Flacco. What do I think? Thank you so much for asking. Unless you're a fan of the Packers (or you're a 12-year-old Patriots fan), you know what it's like to have a quarterback who isn't great when compared to other NFL passers. If you've ever experienced that, you would want to have a guy like Flacco (who was also money during the Ravens' last few playoff runs). Whether that means he's elite or not, I don't know. (The only people I know who are elite are The Young Bucks.) And yes, he signed a big contract. But that's the cost of doing business. It's like when you don't want to pay $11 for a Bud Light at the airport, but you're kind of stuck. And the alternative is unbearable. But give him some help! Maclin will man the slot, but it all comes down to Breshad Perriman becoming something we haven't seen from the Ravens in a while: a successfully developed receiver. The Ravens have drafted 24 receivers, and only one of them -- Torrey Smith -- became good in the NFL. Maclin and Perriman stepping up would be big for Baltimore, which has thrown the ball more than anybody in the last two years. The Ravens and the Steelers have a rather heated rivalry. It's a good rivalry, but to me, it's a lot like Marvel's movies: solid, sometimes even great (like the first "Avengers" and "Logan", though I'm not giving Marvel credit for "Deadpool", which was made in spite of them), but not quite as epic as the football cognoscenti would lead you to believe. Don't get me wrong: I enjoy it. I just don't consider it the pinnacle of professional football that some people seem to. So there is a lot of cool stuff going on here. The teams have met 46 times, with 27 of those games being decided by a score a less, including 19 by three points or less. Last year's Week 16 game was a four-pointer the Steelers won to keep the Ravens out of the playoffs (didn't mean to bring that up). So they do play for some stakes. As an added bonus, these teams are obligated to play each other in prime time, something they'll do on my birthday this year (Dec. 10). And don't worry. I'll be watching. I don't mean to be a football hipster, but I like the Ravens-Patriots rivalry a little bit more. The Ravens beat the Patriots in the 2012 AFC Championship Game -- quite handily, too. And that was one year after the Ravens almost beat the Patriots in the 2011 AFC title game. There are some who contend Lee Evans actually caught the last-minute strike from Flacco that likely would have sent Baltimore to Super Bowl XLVI, which would have meant Baltimore potentially playing in back-to-back Super Bowls. I say they would have handled the Giants in XLVI, and life would be much different. The Ravens and Steelers hate each other, but a lot of older Ravens fans really hate the Colts. As you might know, Baltimore was the former home of the Colts, and some people aren't over that [stuff] yet. So much so, the scoreboard and the PA announcer in Baltimore rarely refer to that team from Indianapolis as "the Colts," because that team (they feel) belongs to Baltimore. As somebody who lost my local team to relocation in my youth, I feel you. BTW, is it weird that John Elway victimized both the Baltimore Colts for forcing that trade during the 1983 NFL Draft and the original Browns in the playoffs a couple of times in the 1980s? Why aren't these guys the Baltimore Browns? The city of Cleveland got to keep the names and marks for the club after Art Modell moved the franchise to Baltimore in 1996. I kind of like this. I mean, the football fans of Baltimore are still stung by losing the Colts, as they should be. So it's cool that they kind of got to start fresh with a new name, one the fans helped pick via a phone poll run by the Baltimore Sun. Modell did try to get the Colts name from the Irsay family, which would have been cool. But that didn't happen (obvs). The other names considered included Americans (like the NES Baseball Stars? ), Bulldogs, Marauders, Mustangs and Railers. Wait, that last one can't be right. Whenever a Steelers fan starts in with the "Sixburgh" stuff, let them kindly know the Ravens and Steelers are actually tied in Super Bowl titles since the Ravens' inception. So there is that. The club won a title rather quickly with a huge victory over the Giants in Super Bowl XXXV, and then a few years ago, the Elite One led the Ravens over the 49ers in the Harbaugh Bowl. I'm now fascinated by the name the Railers. Baltimore native Michael Phelps (yep, that dude who is going to race a shark) is a huge Ravens fan. And the feeling is mutual. In fact, the Ravens showed Phelps going for the gold in the 2016 Summer Olympics during their preseason game. Respect. Not as glorious as it once was. Still pretty good, though. I remember watching the 2003 NFL Draft unfold and knowing Terrell Suggs wasn't going to fall all the way to No. 14 for my Chicago Bears. You can't blame a guy for wishing -- it would've been sweet. (That said, the Cardinals held the sixth overall pick and traded down. How did you not draft the best player of his generation when he played college football in your stadium???) Suggs was picked 10th overall by the Ravens and eventually won the 2011 NFL Defensive Player of the Year award, along with a Super Bowl ring. He now calls himself Darth Sizzle, and I just couldn't love the guy more than I already do. Seriously, he's been doing this since 2003, which is the year that "The O.C." debuted on FOX. It's crazy, man. Justin Tucker is my favorite. First, he mentioned fantasy football after he won a game. And if you know me (if you don't ... hi, I'm Adam), you know I typically make my bread in fantasy football. Whenever a professional player (even a kicker) acknowledges us dorks, well, it's pretty exciting, akin to Mark Hamill breaking the fourth wall in Episode VIII to say "What's up?" Peter Boulware was an absolute beast for the Ravens. Obviously, playing in the shadow of Ray Lewis is going to take a little shine of off his star. He didn't play long enough to really warrant induction into the Hall Fame, but he was one of the best in the business during his prime. He had 15 sacks in 2001, which was probably his best season. The 2000 Ravens defense is probably one of the most overrated in NFL history. The entire defense was nothing but a bunch of bums. I'm kidding. I'm obligated to say that as a fan of the Chicago Bears. I'm completely kidding, of course. That Ravens' defense was clearly one of the best of all time. It's just that the 1985 Bears were better. I kid! You guys have your claim. We have ours. Let's walk out of this as friends. Ed Reed would be my choice here. I know who you were thinking about, but Reed might be the best to have ever played the safety position. He possessed that innate ability to change the game with a hit or pick-six. The Ravens have had a lot of great defenders, for sure (like obvious answer Ray Lewis), but for my money, I'm going with Reed. I'm not sure anybody bought an Elvis Grbac No. 18 jersey, but you would certainly elicit a lot of laughs if you rocked this. I mean, there might be some people who would be annoyed, because Grbac seemed like such an unnecessary signing after Trent Dilfer won the Super Bowl the previous year, even if you didn't believe in Dilfer as a franchise quarterback. Who would have thought Grbac would be? I don't know, man. That was just a wild decision. Doug Flutie was available, and he might have been a better option. Ravens coach John Harbaugh's brother, Jim, was a one-time quarterback of the Ravens. Maybe his jersey would be better than Elvis' kit. The Ravens have enjoyed some recent success, but jumping on this bandwagon is not out of the question. I love John Harbaugh. Yes, he's the non-crazy Harbaugh, but still as lovable. The defense has long been the hallmark of this team, and this year should be no different. 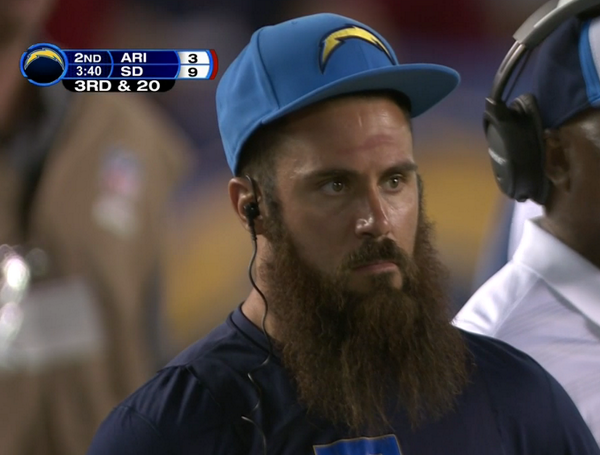 You have Darth Sizzle and @weddlesbeard, who is part of one of the best secondaries in the league. I'm telling you. If you want to find an AFC team that could stop the Patriots, I'd check out the Ravens, because the secondary has enough variety to slow New England's passing attack. And finally, you have an elite quarterback, so you have to feel pretty nice about that.